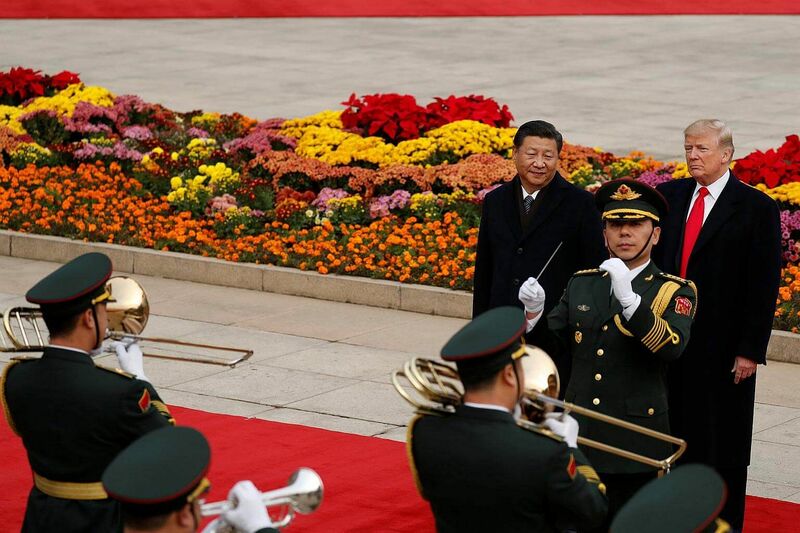 BEIJING - Visiting US President Donald Trump on Thursday (Nov 9) spoke of "an incredibly warm" feeling towards President Xi Jinping as he thanked the Chinese leader for the warm reception he has received since arriving in Beijing on Wednesday afternoon. "My feeling toward you is an incredibly warm one. As we said, there's great chemistry and I think we're going to do tremendous things both for China and the United States," he said, according to a White House pool report. Mr Trump gave high marks for Sino-US bilateral relations, which Mr Xi said on Thursday "are at a new historical starting point". The US President, who is on his first state visit to China since taking office in January, said the two countries would be able to work together to solve "not only our problems, but world problems and problems of great danger and security". "There can be no more important subject than China-US relations... we have the capacity to solve world problems for many years to come," Mr Trump said. On the issue of North Korea, Mr Trump said both sides had an excellent meeting on Thursday morning discussing North Korea. He added that like Mr Xi, he believes that there is a solution to the problem. Mr Xi said that China will persist with the goal of denuclearising the Korean peninsula and solving the issue through talks, reported Reuters. US Secretary of State Rex Tillerson told reporters following the Xi-Trump summit that there is “no disagreement”between both leaders over North Korea. Mr Xi shared with Mr Trump specific actions that China is taking to enforce sanctions against North Korea, such as restrictions on bank accounts, Mr Tillerson told reporters in Beijing. Both leaders will not accept a nuclear-armed North Korea, he added. "China can fix this problem easily and quickly," he said, calling on Mr Xi to "work on it very hard". "I know one thing about your President. If he works on it hard, it'll get done... Time is quickly running out and we have to act fast," said Mr Trump in comments released by the White House. Mr Xi, in his remarks, said it's "natural" for the US and China to sometimes disagree. But he said they must work together to find mutual agreement on key issues. The Chinese President said he had a deep exchange of views with Mr Trump and reached consensus on numerous issues of mutual concern. “For China, cooperation is the only real choice, only win-win can lead to an even better future,” he said in comments carried by Xinhua news agency. Mr Xi said China and the United States strengthened high-level dialogue on all fronts over the past year and increased coordination on major international issues, such as the Korean peninsula and Afghanistan. North Korea has dominated Mr Trump 's agenda since he embarked on his 12-day, five nation tour of Asia. Just a day earlier, in a speech to the South Korea's National Assembly, he had warned Pyongyang of the grave danger of developing nuclear weapons. On the issue of trade, Mr Trump told Mr Xi it was too bad that past US administrations let trade get out of kilter but "we will make it fair to both sides". Earlier on Thursday, Mr Trump was accorded what Chinese state media described as "a very special" and "the highest-level" state welcome ceremony at the Great Hall of the People. In comments carried by pool reports, the US leader said: "The hosting of the military parade this morning was magnificent. The world was watching. I've already had people call from all over the world. They were all watching. Nothing you can see is so beautiful." Mr Trump was wearing what Chinese state media called a "China red" tie, while Mrs Melania Trump was wearing a long black and white dress with floral motifs. Mr Trump arrived in Beijing on Wednesday afternoon for a three-day state visit. China is the third stop of Mr Trump's 12-day, five-nation tour of Asia, which started in Japan on Sunday (Nov 5). China has been keen to show the importance it puts on Mr Trump's visit, the first by a foreign leader since the end of a key Communist Party Congress last month where Mr Xi cemented his power. On Wednesday, Mr Xi gave Mr Trump the rare honour of a personal tour of the Forbidden City. The UNESCO World Heritage site was closed for one day on Wednesday. During their talks on Thursday, Mr Trump also spoke highly of the "absolutely terrific" meeting he had with Mr Xi on Wednesday night. "We had a dinner that was going to last quickly - 20 or 25 minutes - because I was traveling and you were so nice and you said, 'we'll just do a quick dinner.' And I think it has to last at least two hours and we enjoyed every minute of it with your beautiful wife and Melania together," he said. The US leader also took to Twitter after dinner on Wednesday to thank his Chinese hosts. According to the official news agency Xinhua, China is pulling out all the stops to make the US president feel welcomed and honoured. Protocol is extremely important in Chinese diplomacy, and such events are always carefully choreographed down to the tiniest detail, said Xinhua in a voiceover for Thursday's ceremony. Sparks flew between both countries in September last year (2016) when then US president Barack Obama was not provided with a staircase to leave his Air Force One plane during his chaotic arrival in Hangzhou before the start of the Group of 20 summit. He had to disembark from the plane through a rarely used metal stairway, instead of the rolling red-carpet staircase provided for other foreign leaders including Japanese Prime Minister Shinzo Abe. The so-called "Carpet-gate" saga led to accusations that China was trying to deliver a calculated diplomatic snub to the US leader to signal its displeasure at US support for a Hague-based tribunal's ruling that dismissed China's maritime claims in the South China Sea, and also its deployment of a missile defence system in South Korea. 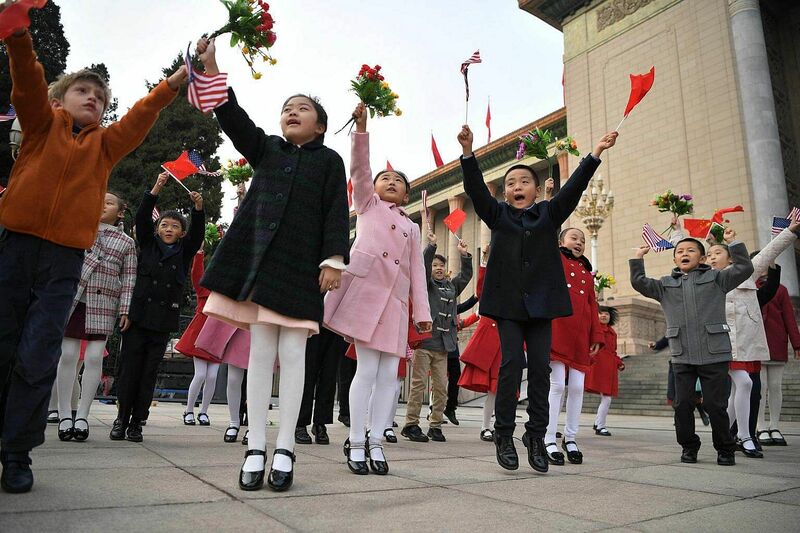 Children wave national flags before the arrival of China's President Xi Jinping and US President Donald Trump during a welcome ceremony at the Great Hall of the People in Beijing. 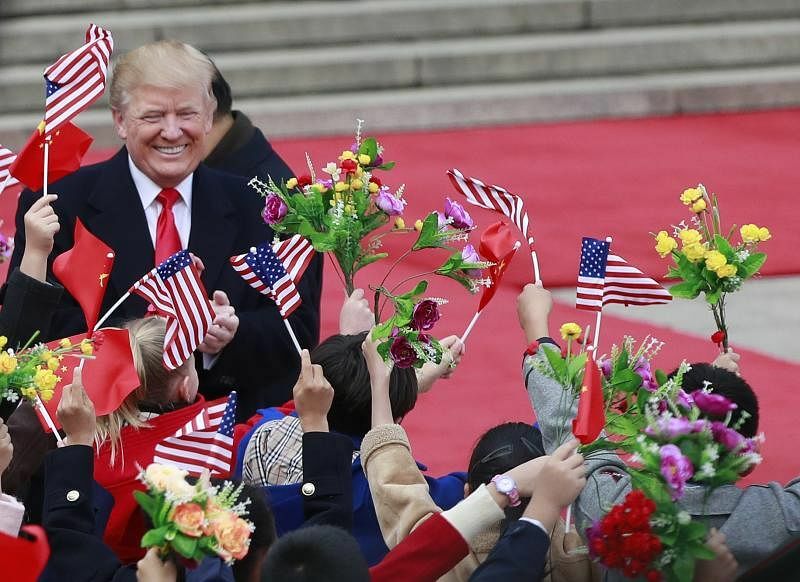 Chinese state media on Thursday praised the tone of the initial get-together on the first day, part of what China has promised will be a "state visit plus" for Trump. 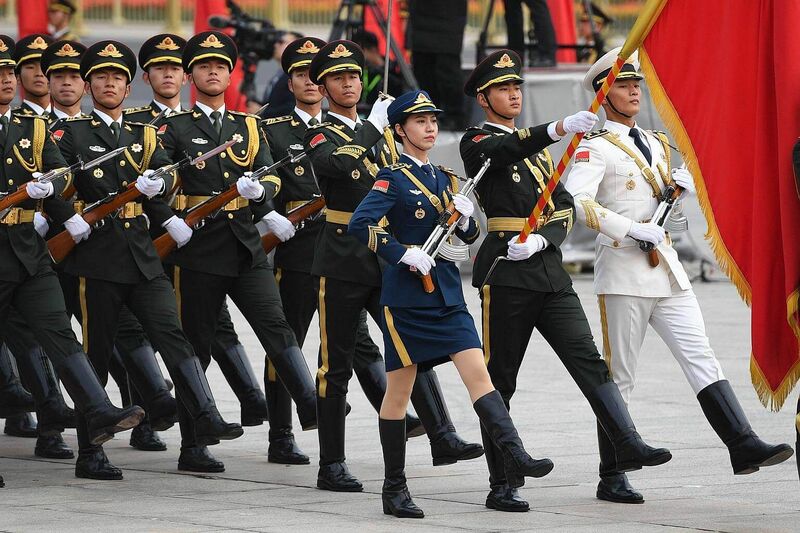 Beijing wants to make sure the visit will be a success. "If China and the US have good relations, then many global issues can be resolved easily," Professor Jia Qingguo of Peking University told The Straits Times.